2019 Chrysler Pacifica Limited- our last Chrysler was a 2008 purchased from a dealer friend. Our experience with Bill Stickley our Product Specialist and Don Wulff our finance guy gave us that FRIEND feeling. Todd Phillips in internet sales routed our messages perfectly. The process was straightforward, simple and took less time than we had anticipated. Kudo’s to the team at Phillips’s for making a repeat customer of our family. JD Davis did an outstanding job helping us to determine exactly which vehicle to purchase and researched where one was located. Management and the finance office provided the needed support to make the deal work. Very good buying experience. Bought a new Wrangler here last weekend and I'm very happy with my purchase. The buying process seemed like they've worked to make it streamlined & easy here! 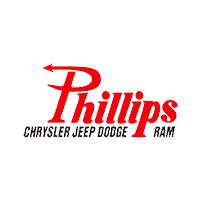 The entire experience at Phillips Chrysler begins when you walk in the door, everyone is friendly and pleasant with no pressure at any time. We purchased two new vehicles from Phillips this past month and they went above and beyond for both purchases. Specifically on the Ram 1500 we required a trailer brake, Phillips did not have this in stock, our sales rep Brian called around until he found one ultimately purchasing this himself to aid us in getting this taken care of as quickly as possible. We were very impressed by the Service waiting area, comfortable with an assortment of snacks and beverages. Phillips strives and succeeds in making the buying process quick and painless. We spent more time deciding on the vehicle to purchase than was spent in the actual purchase process. Easiest buying experience of my life! Thank you Sonny Wallace, Dennis Ross, and John Cherry for making this a stress free deal! Friendly people, easy to work with and very accomodating to my husband, myself and my children. The purchase was quick and easy. I bought a vehicle that had just been traded in so it was a little dirty. Wish they could've taken a little more time on the inside and atleast shampoo the seats. But since that's my only complain I'm very very happy!